With the Premier League season well underway, the only thing missing has been a new version of the celebrated FIFA franchise from EA Sports, with new rosters for the 2013/14 season. As of right now, the wait is over with FIFA 14 now available to download from the Apple App Store, Google Play and the Amazon Appstore. Interestingly, the app is now free to download for all platforms, with EA hoping to recoup the coinage by tempting users buying the full game through a "Premium Unlock" in-app purchase. As a continuation of EA's aim to make gamers spend more on in-app purchases than Real Madrid forked over for Gareth Bale, FIFA 14 owners can buy different game modes and purchase FIFA Points to boost their stature in the transfer market. The simultaneous launch is a big boost for the Android and Amazon platforms as both were completely passed over when FIFA 13 arrived last year. As usual, the game is fully licensed and brings 33 leagues, over 600 licensed teams, more than 16,000 players and 34 authentic stadiums. 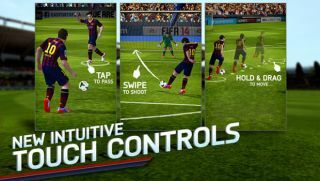 In terms of new features, the developer promises new touch controls, that allow players to be dragged around the field, while tap to pass and swipe to shoot has also been added into the mix. We're intrigued to give the new FIFA control method a try as, in the past, the game has suffered slightly from the hit-and-miss touchscreen D-pad and buttons. Will you love FIFA 14 for Xbox One and PS4? Why the jury is still out.